Early Childhood Services, families and the wider community were invited to attend the ‘Beyond Sparkles and Superheroes’ children’s book launch that promoted picture books for children 0-6 years providing a rich source of material for both informing and celebrating difference. As parents, educators and teachers we are all aware of how crucial and influential the early years are on a child’s development. There is no doubt that stereotypes can be incredibly harmful. They help to fuel inequality long into adulthood and can have a harmful effect on both girls and boys. “A key message for us is encouraging children to imagine the possibilities of what they can do in a way that is not limited by their gender and that small differences – such as likes, dislikes, strengths and weaknesses – are not based on gender,” said Robyn Williams of Maroondah City Council, who worked with EACH, Women’s Health East, Eastern Regional Libraries, Knox and Yarra Ranges Councils to produce the booklist. “Parents can play an active role in expanding children’s horizons by reading books that challenge traditional gender stereotypes and that is what all of the books on the booklist do,” Robyn said. 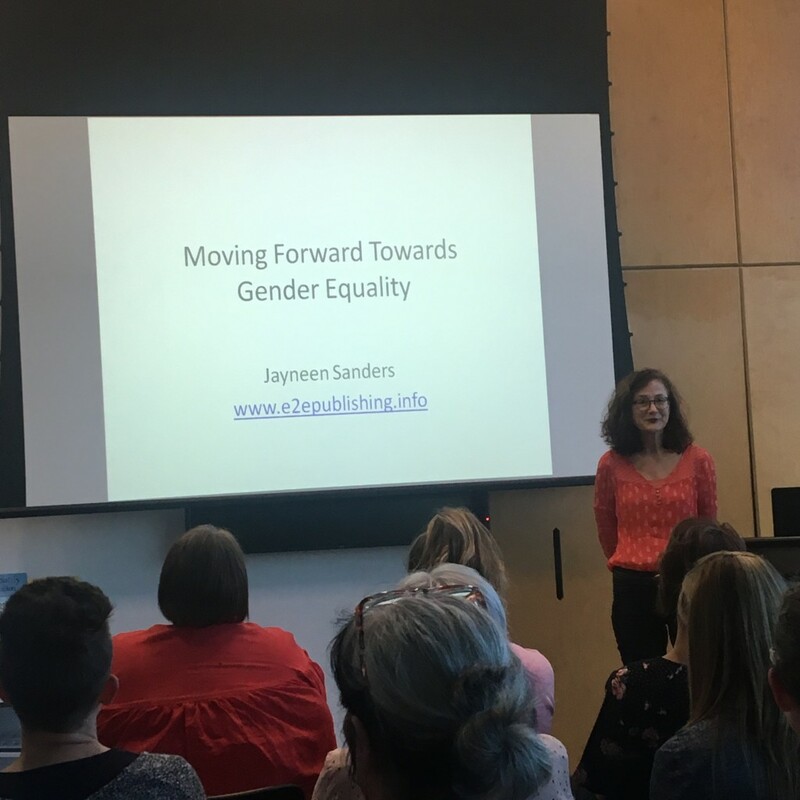 “Gender sells” was one of the key messages from Jayneen Sanders who spoke at the launch of the booklist on the evening of the 25th October, at Realm Library, Ringwood. “It sells toys, movies, books etc. but we do not need to be part of this, we can challenge gender stereotyping as part of our everyday work and lives,” Jayneen said. Jayneen Sanders, provided the audience with tips on using language to break down gender stereotypes. Catherine Delaney, Health Promotion Officer at EACH stated that “Jayneen was truly inspirational on how she communicated with her audience. She shared advice on ‘how’ we are reading books to children and ‘how’ to use a GE lens in sharing these stories as well as challenge gender stereotypes”. Having been a primary school teacher herself for many years it was evident that the audience which comprised of a significant number of educators and teachers really related to the key messages she shared around gender equality in the early years settings. Sharing this booklist with Early Childhood Educators and families is a great way to break down gender stereotypes and promote gender equality to ensure that children are not limited by gendered expectations. These books are about inspiring children to change the whole way they view their future. 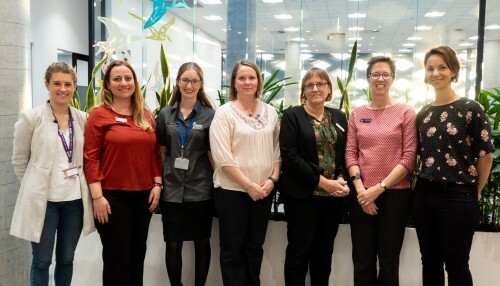 The beyond Sparkles and Superheroes Childrens Book Launch was facilitated by Maroondah City Council and supported by EACH Health Promotion, Eastern Regional Libraries, Knox City Council, Women’s Health East, and Yarra Ranges Council. 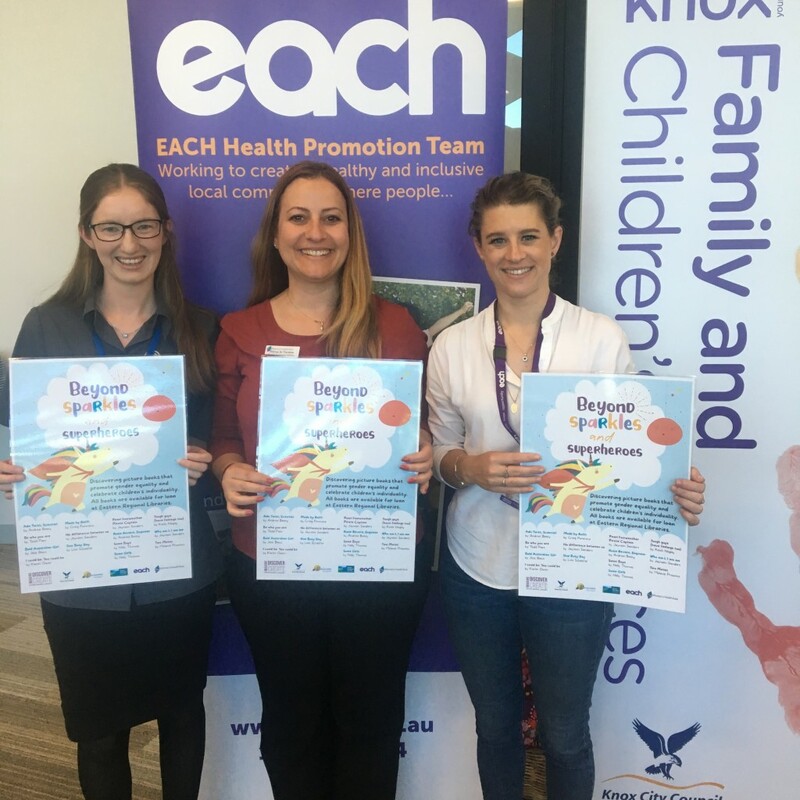 If your early childhood service would like to promote the ‘Beyond Sparkles and Superheroes’ poster and bookmarks please contact Catherine Delaney, Health Promotion Officer at EACH via Catherine.delaney@each.com.au.